Once she was Eon, a girl disguised as a boy, risking her life for the chance to become Dragoneye apprentice. Now she is Eona, the Mirror Dragoneye, her country’s savior–but she has an even more dangerous secret. She cannot control her power. Each time she tries to bond with her Mirror Dragon, she becomes a conduit for the ten spirit dragons whose Dragoneyes were murdered by Lord Ido. Their anguish floods through her, twisting her ability into a killing force, destroying the land and it’s people. And another force of destruction is on her trail. Along with Ryko and Lady Dela, Eona is on the run from High Lord Sethon’s army. The renegades must find Kygo, the young Pearl Emperor, who needs Eona’s power if he is to wrest back his throne from Sethon. But if Eona is to help Kygo, she must drive a dark bargain with an old enemy that could obliterate them all. Review: The sequel to Eona is a true beauty, a gem in the world of YA literature. I enjoyed the first book, Eon, greatly, but this was even better. Alison Goodman continues this fascinating story with unwavering talent and passion. The characters were as rich as ever, and the plot couldn’t get any thicker. Alison’s writing is crisply refreshing compared to many of the other titles she shares the genre with. I must commend her for that. While indulging upon these savory words, I realized that Eona affected me like no book has in a long time. I absolutely couldn’t set it down. I was completely enthralled while reading and often couldn’t look away when someone tried to get my attention. This is a remarkable feat because I often can’t find a book so capturing. It is truly phenomenal. Overall, I believe the series ended excellently. Alison Goodman infused the climax with much action and plenty of excitement. I have to admit that just thinking about it heightens my enthusiasm. I am such a book geek, am I not? 😉 A bibliophile, I guess. Anyway, I recommend this book to anyone who enjoys a powerful plot, strong emotions, and conflicted romance. It’s during this dark time that Doon finds an unusual book. Torn up and missing most of its pages, it alludes to a mysterious device, a piece of technology from before the Disaster. Doon becomes convinced that the Builders of Ember meant for them to find the device when they left the city, to help them in their new lives. Together, Lina and Doon must go back underground to retrieve what was lost and bring light to a dark world. 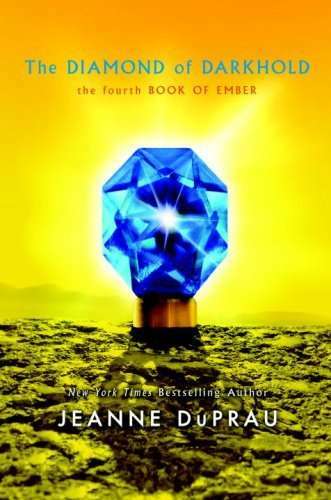 In the fourth Book of Ember, bestselling author Jeanne DePrau juxtaposes yet another action-packed adventure with powerful themes of hope, learning, and the search for truth. Review: The Diamond of Darkhold is the fourth and last installment of the spectacular “Books of Ember” series. It was an absolute thrill to read and I enjoyed watching it come to a formidable end. When Doon and Lina led the people of Ember out of their dying underground city and into the world above, everything was different and strange. A few months have passed since then, and the people of Ember are living in the small village of Sparks. Life in this new world is difficult, especially when facing the hardships of the Emberite’s first winter. Harsh weather and quickly depleting food and medical supplies make some Emberites think back to their easier life in Ember. Valuable supplies were left behind in Ember during the final rush to evacuate the city before the once-great generator finally gave out. If these supplies could be retrieved, it could make all the difference for life in Sparks. In the story, Doon and Lina discover an ancient book written by the Builders of Ember. The unusual book is nearly destroyed, but it hints at an advanced device that the Builders might have left behind for the Emberites. This device was built to help make life for the citizens of Ember above ground easier. Together, Lina and Doon return to the abandoned city of Ember to find this device from the Builders. But Ember is a different city now, and is definitely not what they expect. “The Diamond of Darkhold” is another great book from Jeanne DuPrau. The plot is immaculate, with plenty of great details and fresh new looks at areas of Ember that readers didn’t get to see before. With each new Book of Ember DuPrau shares just a little more information about the grand plot and intricate workings behind the history of Ember. I highly recommend “The Diamond of Darkhold” and the entire “Books of Ember” series to anyone who not just loves a fantastic adventure, but also a story with great moral inclinations. DuPrau, Jeanne. (2008). The Diamond of Darkhold. New York: Yearling. Summary: War looms on the horizon as eleven-year-old Nickie and her aunt travel to the small town of Yonwood, North Carolina. There, one of the town’s respected citizens has had a terrible vision of fire and destruction. As the people of Yonwood scramble to make sense of the woman’s mysterious utterances, Nickie explores the oddities she finds around town, while keeping an eye out for ways to help the world. Is this vision her chance? Or is it already too late to avoid a devastating war? In this prequel to the acclaimed The City of Ember and The People of Sparks, Jeanne DuPrau investigates how, in a world that seems out of control, hope and comfort can be found in the strangest of places. Review: I have been a fan of the Books of Ember series ever since I opened Jeanne Duprau ‘s debut for the first time. But after reading the third installment, The Prophet of Yonwood, for the second, I truly understand the wisdom she was trying to impart through her books. To understand what I am trying to say, I guess you would have to read it for yourself. I wouldn’t want to give any spoilers away. 😉 The prequel to The City of Ember is a truly great read. Besides describing the adventures of a young girl named Nickie, The Prophet of Yonwood has several pretty great moral statements. The setting of the story is present-day (maybe a few decades into the future) in Yonwood, North Carolina, a small town in the United States. The book begins with a respected citizen of Yonwood, Althea Tower, having an apocalyptic vision, in which she envisions a future filled with explosions, fire, and violence. Althea Tower is named a Prophet by the town members, and the residents of Yonwood are struck by terror at the face of such a bleak future (especially with their country on the brink of a war). Yonwood tries to better itself in the name of God so that they may be spared this prophesied future. A few months later, Nickie, the protagonist of the story, and her aunt, Crystal, arrive in Yonwood planning to sell Nickie’s great-grandfather’s house, named Greenhaven. The story tells of how Nickie attempts to accomplish 3 inner goals, and of how she and Yonwood react to each other. Many of the themes in Jeanne DuPrau’s earlier books are also present in The Prophet of Yonwood, with a few new additions as well. The characters and plot are excellently built. All the characters are believable and quirky and the plot is easy to follow and is very interesting. In addition to delivering a fantastic story, Jeanne DuPrau has also presented quite a few moral themes in The Prophet of Yonwood. Throughout the book, she offers themes such as utopias, choice of trusts and sacrifice, true love, and life in general. Although she addresses many deep and philosophical topics, she does not disrupt the easy flow of the book. Adults and children both can enjoy this great read. I certainly did. DuPrau, Jeanne. (2006). The Prophet of Yonwood. New York: Yearling. Summary: When Lina and Doon lead their people up from the underground city of Ember, they discover a surface world of color and life. The people of a small village called Sparks agree to help the Emberites, but the villagers have never had to share their world before. Soon differences between the two groups escalate, and it’s up to Lina and Doon to find a way to avoid war! Review: The second installment of The Books of Ember series is a spectacular sequel to the first! I was completely hyped-up as I read it for the first time, but the second was even better. DuPrau adventures further into the realm of morals, leaving a satisfied reader with another clear message: War can bring nothing good and as easy as it is to achieve, it is hard to escape. I am absolutely fond of this book, zealous even. The People of Sparks is not just an awesome adventure, but a thought-provoking and fascinating novel too. It was mindfully written and should appeal to adults as well as kids. When the people of Ember surfaced from their dying city at last, they were introduced to an entirely different world. Instead of the familiar darkness and electric lights of their underground home, they were faced with an abundance of color, nearly painful heat, and light that came from the sky. The people of Ember were welcomed to this new and terrifying world by a small village called Sparks. The people of Sparks invite the Emberites into their homes and even feed them in return for hard work. Together, the two groups of people are forced to work together to survive in the world, nearly driving themselves to the brink of war in the process. Anyway, The People of Sparks is a fabulous read for those who are familiar The City of Ember. I recommend it to anyone who likes a good adventure, coupled with a strong moral. DuPrau, Jeanne. (2004). The People of Sparks. New York: Yearling. Summary: Lina Mayfleet desperately wants to be a messenger. Instead, she draws the dreaded job of Pipeworks laborer, which means she’ll be working in damp tunnels deep underground. Doon Harrow draws messenger–and asks Lina to trade! Doon wants to be underground. That’s where the generator is, and Doon has ideas about how to fix it. For as long as anyone can remember, the great lights of Ember have kept the endless darkness at bay. But now the lights are beginning to flicker. . . .
Review: Jeanne DuPrau’s debut was absolutely exciting. She has concocted a great plot and a strong message for readers of this fantastic novel. Her writing was clear and refreshing, and her characters were wonderfully original. I enjoyed this book quite a bit and was left craving the next in the series. The cliffhanger ending was stunning. The City of Ember was essentially built as a giant fallout shelter. Once, many years ago, the world underwent a dramatic disaster, presumably a war. The Builders who constructed Ember believed that the entire human populace would be wiped out during this catastrophe, and decided to construct a way to preserve some portion of humanity. So the City of Ember was constructed, a settlement buried deep underground in a giant cave, where hopefully it would survive the after-effects of a cataclysmic war. Ember was supplied by the Builders with a massive hydro-electric generator that was capable of powering the entire city with lights, running water, and other conveniences. An abundance of canned food and other goods filled the impressive storerooms beneath the city, where it seemed it would never be depleted. The Emberites could live there almost forever. . . . Until their food begins to run out or the lights start to flicker. Overall, the entire book was enthralling. From the very beginning, the novel had me captured. It is a very quick read, in part due to it’s size and also because you can’t put it down until you are finished. Besides an exciting and fast-paced adventure, The City of Ember also has a very clear and powerful moral: Greed can only ever harm yourself and others. This is a fantastic read for kids and adults alike. DuPrau, Jeanne. (2003). The City of Ember. New York: Yearling. Summary- The truth: Nicholas Flamel was born in Paris on September 28, 1330. Nearly seven hundred years later, he is acknowledged as the greatest Alchemyst of his day. It is said that he discovered the secret of eternal life. The legend: Nicholas Flamel lives. But only because he has been making the elixir of life for centuries. The secret of eternal life is hidden within the book he protects–the Book of Abraham the Mage. It’s the most powerful book that has ever existed. In the wrong hands, it will destroy the world. That’s exactly what Dr. John Dee plans to do when he steals it. Humankind won’t know what’s happening until it’s too late. And if the prophecy is right, Sophie and Josh Newman are the nly ones with the power to save the world as we know it. Review- This was a pretty decent read that left me eager for the next in the series. The legend of Nicholas Flamel always interested me and Michael Scott’s book helped satisfy my curiosity, even though it is a work of fiction. 😉 Out of all of the Alchemyst’s aspects, I believe I enjoyed the plot above the rest. It was fast-paced, full of action, and not something I read VERY often. I could tell it would be better suited for a slightly younger audience than myself, but I still enjoyed the book greatily. The accuracy of the many historical references in the story was astonishing. Michael Scott sure knows how to research. All but two characters, the protagonists, were true individuals or mythical figures. That is quite a feat considering the vast amount amount of characters. Summary- Twelve-year old Eon has been in training for years. His intensive study of Dragon Magic, based on East Asian astrology, involves two kinds of skills: sword-work and magical aptitude. He and his master hope that he will be chosen as a Dragoneye–an apprentice to one of the twelve energy dragons of good fortune. Eon: Dragoneye Reborn was an extremely enjoyable read. The plot was completely enthralling and the East Asian astrology truly had me mystified at times. Alison Goodman is one of those YA authors that I had never heard of until reading one of her books. She definitely proved her skills while creating the world of Eon. Her commendable writing prowess can be even further enjoyed by reading a few of her other books. The aspects that I particularily enjoyed while reading were the inclinations of women’s freedom and rights. Eon, or Eona I should say, was a determined and strong female who was forced to disguise herself as a guy if she wished to be succesful in the world. She even resorted to drugs in some cases to supress her femininity. While this worked, it also suppressed her abilities to call her dragon, the Mirror Dragon. The Mirror Dragon is the only female dargon of the twelve celestial dragons and is the most powerful. While females were forbidden to become Dragoneyes, the Mirror Dragon was lost. The Mirror Dragon is such named because it’s true name is the same as its Dragoneye. When Eona was chosen by the Mirror Dragon she was unable to fully connect with it because she wouldn’t accept her true name, Eona, instead of Eon. The story continued to describe her continued suppression of her femininity and dragon. At the end of the book, a marvelous event occured. Eona accepted her true self. This was an act of great strength. She fully bonded with her dragon and became the true Mirror Dragoneye. I believe this is a message to women telling them not the be pushed down by social constraints and that their only true power lies in accepting their true selves. Summary: Jason Walker has often wished his life could be a bit less predictable–until a routine day at the zoo ends with Jason transporting from the hippo tank into a strange, imperiled world. Lyrian is full of dangers and challenges unlike any place Jason has ever known. The people live in fear of their malicious wizard emperor, Maldor. The brave resistors who once opposed Maldor have been bought off or broken, leaving a realm where fear and suspicion prevail. In his search for a way home, Jason meets Rachel, who was also mysteriously drawn to Lyrian from our world. Jason and Rachel become entangled in a quest to piece together the word of power that can destroy the emperor, and learn that their best hope to find a way home will be to save this world without heroes. Review: This is the second series of Brandon Mull’s that I have read. I gotta say, I’ve enjoyed it immensely. Fablehaven, his first series, was very satisfying but there is something even more appealing about Beyonders. The world of Lyrian was a great work of art even though I wish a map was included with the the book. The chraracters were well placed in plot and were very crucial to the developing storyline.